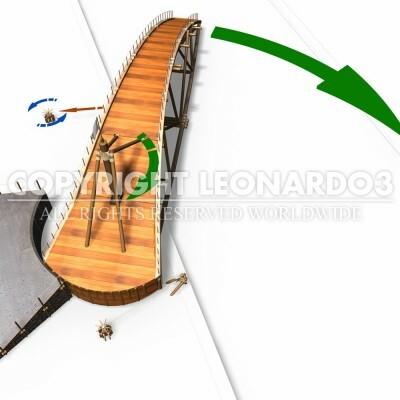 This bridge consists of a single span and is one of the most spectacular and futuristic of the bridges Leonardo designed. It forms part of his urban studies, which anticipated the construction of new settlements around a close network of canals that were to serve as drains and as waterways for commercial transport. Through an articulated system of winches and wheels, the bridge is made to rotate by 90°, thus allowing boats to pass or both banks of the canal to be cut off. To maintain the bridge’s balance when open, and to prevent the whole structure from giving way beneath its own forward weight, Leonardo provided a caisson full of stones to act as a counterbalance until the bridge came to rest on the other bank. The choice of an arched structure ending beneath the counterweight recalls the shape of a loaded torsional catapult. 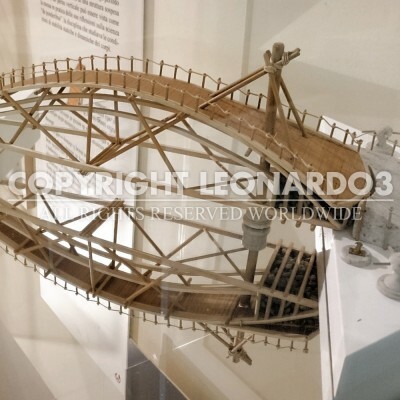 Leonardo could have derived his design of this bridge from just such a war machine, which remains balanced on its vertical supports if loaded with enough weight. 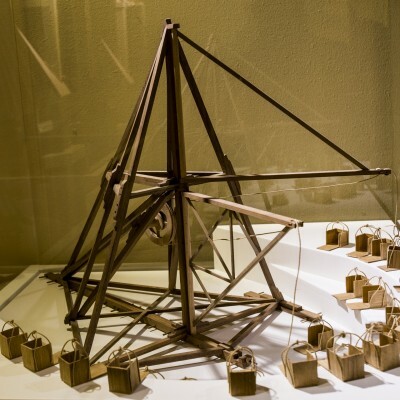 Studies and experiments on balance formed one of the principal applications to which Leonardo devoted himself during the first years of his stay in Milan. The creation of a structure suspended around a vertical pivot can be seen as the practical application of his work on the science “de ponderibus”, the study of the conditions surrounding the static and dynamic stability of bodies.